The 2011 Motorola XOOM is one of the most legendary Android devices of all time, even if it wasn't a very good product. Motorola and Google went big with a Super Bowl commercial, and it was the first device to run the tablet-tailored Android 3.0 Honeycomb. It was perhaps the first real iPad competitor, but the high initial price and lack of tablet-optimized apps meant it never really took off. Later that year, Motorola released an incremental update, and that was the last tablet Motorola ever made... until today. The company's new tablet isn't a blockbuster, or really noteworthy at all. In fact, Motorola didn't even announce it - Lenovo did. It seems likely that Lenovo is actually the one who developed and manufactured it, as it looks remarkably similar to the Lenovo Tab 4 10". It even has many of Lenovo's common UI tweaks, like the user switcher on the lock screen. This is probably the tablet that was previously rumored earlier this year. The 'Moto Tab,' as it's named, is a fairly average tablet being sold exclusively at AT&T. It has a Snapdragon 625 with 2GB of RAM and 32GB of expandable storage, complete with Android 7.1 and a "kids mode" for locking down access to content and apps. It also has a fingerprint sensor, dual front-facing speakers, and a Type-C port. AT&T customers can buy it starting November 17, for $15/month for 20 months, or full-price for $299.99. 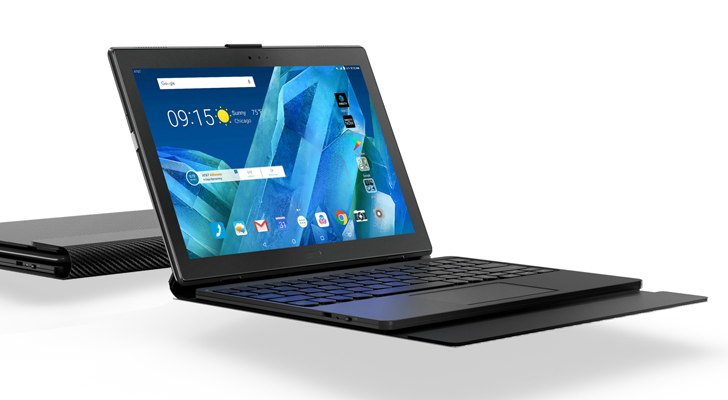 If you were hoping for a Xoom successor, this is absolutely not it, but it seems decent enough.